The Oxford Similarity Checker (Oxsic) and the team behind it are proud to announce the launch of a Live Plagiarism Map. For the very first time, everyone interested can look, interact and see actual live statistical information about the occurrence of plagiarism around the globe. According to the map, Russians tend to plagiarise 2.5 times more than Americans. We seek to raise awareness on plagiarism globally. By enabling people, not just our users, but people in general with the right tools to know more about plagiarism, Oxsic wishes to improve insights and related decisions in every member of our society. The Oxford Similarity Checker (Oxsic) and the team behind it are proud to announce the launch of a Live Plagiarism Map. For the very first time, everyone interested can look, interact and see actual live statistical information about the occurrence of plagiarism around the globe. 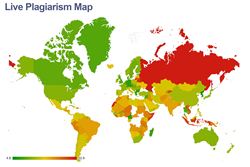 The map is color-coded, so anyone, at first glance, can see in which countries plagiarism is most-prevalent and where it is less occurring. Green tones indicate a “purer” content with less plagiarism, yellow tones – middle of the pack, red ones – a significant spread of plagiarism. The map has tools to help everyone navigate through and analyze the information at hand. Seeing what’s what is made very simple. Even if you are viewing the map for the first time, you will notice that Russians tend to plagiarise 2.5 times more than Americans. Are you interested in what is going on with your country? Scroll over and get your most up-to-date answer within seconds. Oxsic’s plagiarism map is “live,” meaning that it is continuously being updated with the most recent and up-to-date statistics. Oxford Similarity Checker’s team regularly gathers data from users, monitors other statistical databases and compiles it here, for every user to see. Scroll the mouse on your country to see whether copycats have a safer haven here or in the neighboring country. With millions of documents analyzed and checked for plagiarism, Oxsic is one of the world’s leading plagiarism checking software and wishes to stay ahead by introducing innovative, interesting, useful features for its users and their benefits. The map is free, so every user can access it, analyze and share the data with others, enlighten him or herself and share that knowledge with others. Information is gathered in more than 130 languages, so almost all of the world is involved in the statistical analysis carried out by the team at Oxford Plagiarism Checker. Oxford Similarity Checker is AI-powered professional plagiarism checking service which is creating hi-end solutions for companies and educational organizations.